This is part of a series on improving my cardmaking through studying other designers' cards. If you're unfamiliar with this series, you can learn more about it here. 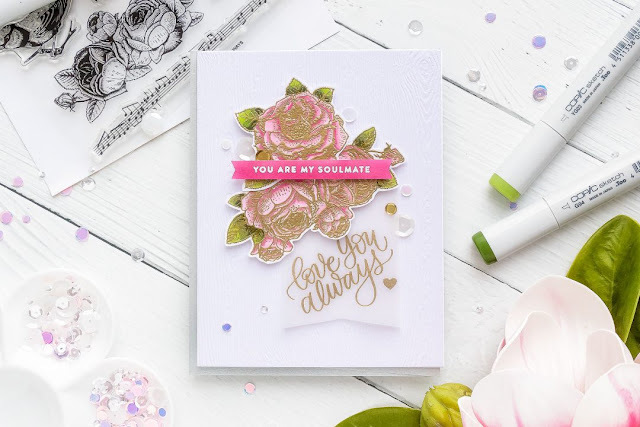 Today I wanted to focus on using Yana's Perfect Cardmaking Formula. 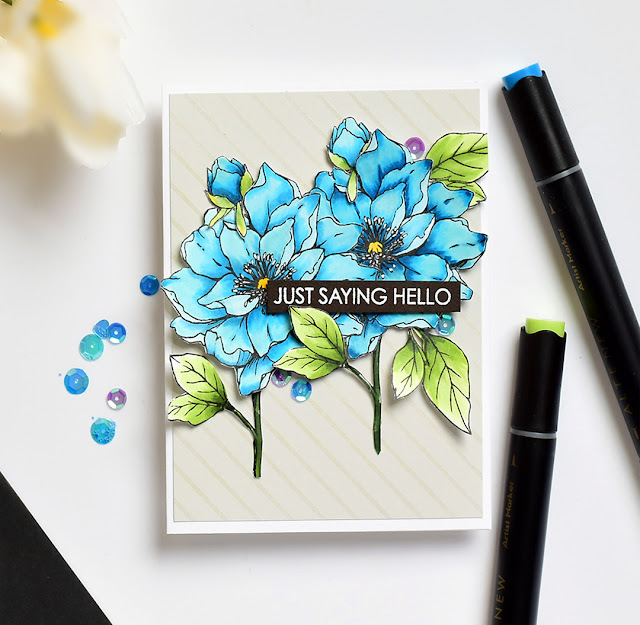 Yana's formula is basically: 1. a pretty floral, 2. a skinny sentiment, and 3. a specialty paper in the background, such as woodgrain or a pattern. Here's a couple of cards Yana made using that formula. More recently, Yana discussed her formula here, where she posted this card. I love the idea of an easy to use and easy to remember "formula." The floral clusters and sentiment form a perfect focal point -- even though there are a lot of elements, my eye immediately goes to the flowers. A clear focal point is essential to any card. Yana mixed it up a bit. 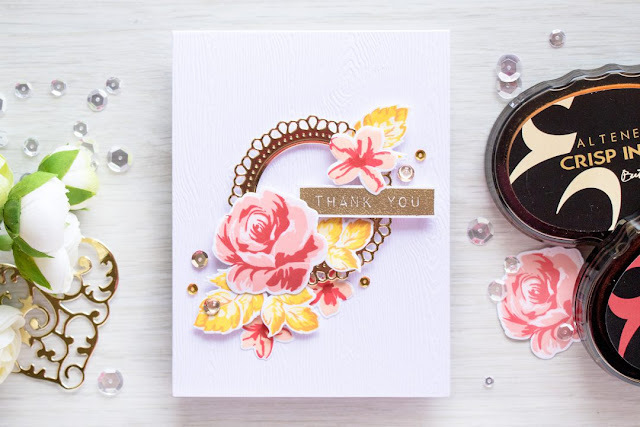 In the first card, she used a beautiful gold die in place of specialty paper. In the second, she added another sentiment on a piece of vellum. Both are clever and add a lot of interest to her cards. A "formula" can be a starting point. Love a formula! I wanted something other than a white background to tone down the bright blues and greens so I made my own "specialty paper" by clear embossing a striped background onto pale gray cardstock. (I originally made green striped paper and it was dreadful with these flowers). I don't have a lot of background stamps, but now I see how versatile they are and I'm adding a few to my wish list. Yana often pops up various elements of her cards. I popped up the sentiment, some of the leaves, and the small buds with foam tape. At this point, I was a little unhappy and felt the card was missing something. I went through Yana's instagram account again and noticed that her cards looked more finished than mine. I took a quick photo of my card with my phone. That seems to help me "see" the card better. I noticed that I had colored over the little stamens on the flowers with my alcohol markers. So I added some white gel pen on top of them, and then carefully added some black marker along the edges of some of the leaves and stems to give them a more finished look. It made a difference. It's possible to learn a lot from another stamper, and then take those lessons and make something that is absolutely not a copy. I haven't bought any new craft supplies since I started this series (although I did subscribe to a kit, more on that later). I think what I am learning will help me choose supplies more wisely. 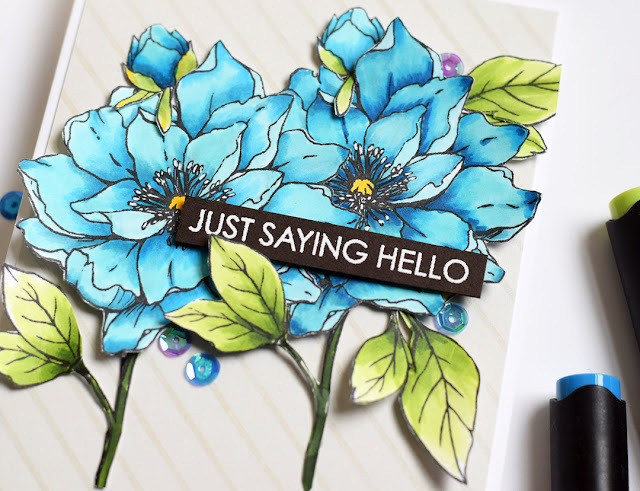 I used Hero Arts stamps for this card, so I am including this in the Blog Name Hero's January Challenge. My Supplies: Hero Arts floral and sentiment stamps (lost the names but do not think they are current); Hero Arts Intense Black ink; Wow Bright White Superfine Embossing Powder; black, white and pale gray cardstocks; Impression Obsession Diagonal Striped cover stamp; Sakura white gel pen; sequins from a specialty Mermaid mix from Hero Arts; Altenew Alcohol Markers; foam tape; JudiKins clear embossing powder. MOOD WHEN DONE: I'm very pleased with how this series is going. I know I don't post a lot of cards, but in the background I'm studying and practicing. I should be back later this week (or next) with some lessons inspired by one of my all time favorite people in paper crafting! Love this series! I am sure there are folks using your cards as their inspiration!! i remember reading Yana's formula and had forgotten it - but think i have been subconsciously using it - your card is lovely and agree the white on the stamen really popped it up - thanks for joining us at A Blog Named Hero this month! I really like that even though you're learning from Yana and drawing inspiration and guidelines from her cards, your card is truly your own—and more than that, shows your own style. While her cards tend towards the feminine, yours has a bolder, graphic vibe, supported by the geometric elements of the sentiment and background. Beautiful card! I'll definitely have to remember that formula. I have decided to try using Firefox as my browser instead of Safari to see if I have better luck with commenting, so we'll see how this goes. Fingers crossed. Joan, Your card is BEAUTIFUL!! Hmmm... I like the idea of a formula. That would be so much easier. I know a very accomplished and popular stamper who once said she has about 3 layouts she uses over and over again. You'd never know because the images, papers, and embellishments change. I need a formula! You learned from Yana, but made this card in your own style and did a beautiful job of it. I like the subtle stripe in the background. Now I think I'll follow your link and read more about Yana's formula. Thanks again, Joan! I am enjoying and learning a lot from your series. Yana is also one of my favorite designers but I had not stopped to really analyze why. Thanks for helping me be a better card maker! Hi Joan, Those blue flowers are really pretty! Love your card. When I look at my cards, they lack "something". Thank you for providing insight on what that "something" might be. I'm interested in knowing what background stamps you plan to purchase.Enjoying your "lessons and cards" series ever so much. Loving this series! I make cards and really don’t think about the design so much. Your series is an eye opener for me. Beautifully colored and designed Joan. Geesh. You picked another of my Yana faves - the first one. (I have to admit I'm not a huge fan of that second one. My eye doesn't really know where to go cuz the elements are all similar sized.) And since her little series on those collage cards I have been on the lookout for the perfect die to make a gold element with. Just check out my wish list on Pinterest! Thanks for pointing out a clue to the finished look the stars achieve. Oh no... There is no "newer post" button below. Guess I have to wait patiently (not my forte). I saw Yana's cardmaking formula video but I haven't tried it as yet. This is giving me inspiration. Great colouring job on those flowers and nice background too. Hero Arts Bold Prints and Impression Obsession Cover-a-card make for great background stamps.... just saying! Beautiful card and I love the blue so pretty and such a great background. You've definitely mastered Yana's formula! 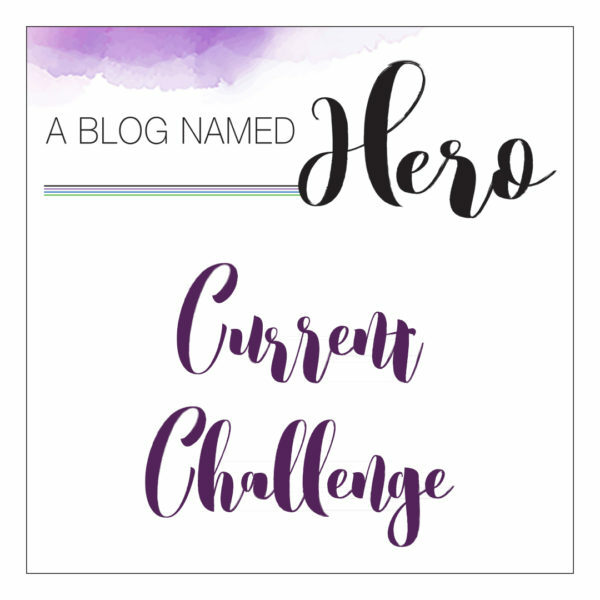 Thanks for playing along at A Blog Named Hero! I absolutely love the card you made. It's beautiful and dramatic.